We opened parks and more parks (and more parks), farmer's markets, affordable homes, and senior and community centers (and preserved what we had! ); we improved our streets and made them safer; we beautified our communities and cut tagging in half. We fought against cuts in services to the poor and for worker justice. We opened our eyes to the tragedy of homelessness and dedicated ourselves to ending it. With your support, I was able to take the oath of office for a second time, and I look forward to serving as your council president in 2006.
from Eric Garcetti & Amy Wakeland and the whole CD13 staff. This was a press conference that no councilmember ever wants to attend. On Friday, December 2, 2005, at around 8:00 p.m., Micheline Fernande Mayes was struck by a car while walking her dog near the home of her son Marc on the 800 block of Lucile Avenue north of Marathon Street. A witness described the suspect vehicle as a 1990-1995 dark-colored Ford Thunderbird, moving quickly when the collision occurred. The driver of the vehicle stopped briefly, and then quickly sped south-bound from the scene. Ms. Mayes was transported by LAFD Paramedics to Hollywood Presbyterian Hospital, where she was later pronounced dead. Her son Marc, pictured in a purple shirt, spoke at today's press conference. The council has issued a reward of $25,000 for information leading to arrest and conviction. Please call Detective Felix Padilla at (213) 972-1825 with any information or questions. 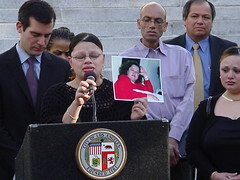 On Sunday, December 11, 2005 at about 10:40p.m., on Virgil Avenue near the intersection of Burns Avenue, Sulma Orellana, a 29-year-old resident of Los Angeles was standing on the east side of Virgil Avenue adjacent to the parked cars at the east curb, when she was struck by a vehicle that was described as either a Ford, Dodge or Nissan pickup truck. The truck was travelling northbound on Virgil Avenue. Orellana was transported by LAFD Paramedics to USCMC where she was later pronounced dead. A single mother, she leaves behind three children. Her sister Carol is shown here, holding up a picture of Sulma. We were also able to approve a $25,000 reward for information leading to arrest and conviction. Detective Mike Kaden is investigating.Please call him at (213) 972-1825 with any information or questions. Please, drive safely this holiday season. The consequences of not doing so were made all too clear by Marc's and Carol's words today. I have named David Gershwin my new chief of staff. And to Ana Guerrero, whom I named Deputy Chief of Staff in July of this year, I have given the responsibility of Director of Council Relations. I've known David since 1998, when we were active in local politics together. He carries a wealth of experience both in this building and as a proven leader of community organizations. He's currently the Director of Government Relations for The Jewish Federation of Greater Los Angeles (he will join my staff in late January). He joined The Jewish Federation from the Los Angeles office of the MWW Group, where he oversaw media relations and strategic communications planning. Before that, he served as Director of Communications for Alex Padilla when he served as Council President, so he'll be great to have by my side as I take the President's chair in January. In addition to setting an example for political communications here, he also did great work for Councilmember Padilla on the issue of San Fernando Valley secession and other legislative issues. I'm eager to have him help me set and execute my agenda. Ana Guerrero, of course, is known to many readers of my blog, and she has left an indelible imprint on the improvements we have been making together with the residents of CD13. She's been a leader on my staff and in the communities I represent since my first day in office. 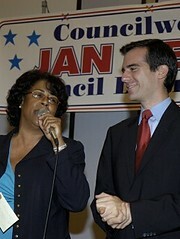 A constant friend and a critical advisor, she has helped me renew the neighborhoods of Council District 13. As my Director of Council Relations, she is going to bring this same talent and energy to work with my council colleagues. My vision for the presidency is to promote each councilmember's legislative priorities in order to produce a collective vision for Los Angeles, and Ana will help me make this happen. Ana's experience is perfect for this challenge. Before her work in CD13, she was a well-known community organizer. She served as the lead organizer of UNO, the United Neighborhoods Organization of Los Angeles, running a campaign with them that naturalized 5,000 new citizens. She organized, with my partner Amy Wakeland, the Progressive Los Angeles Network, which brought dozens of thinkers, activists and leaders from Los Angeles together to collaborate on policy proposals that are still being used and enacted today. But most of all, she's demonstrated unparalleled tenacity, creativity and finesse in leading my district operation, and, during my search for a new chief of staff, being my right-hand woman. I'll update you in a post tomorrow about some other exciting developments in my staff, especially in my field operation. For today, welcome, David, and congratulations, Ana. On January 1st, when I assume the office of the Council President, Jan Perry will join me as Assistant President Pro Tempore. This position, appointed by the Council President, means that Jan will join Wendy Greuel and me as the leadership team of the City Council. (Wendy is the President Pro Tempore, a position that is elected by a vote of all the councilmembers) Technically, this means that Jan, like Wendy, will chair council meetings when I am either absent or participating in the discussion of a given item. More broadly, it means the three of us will be working together to help the rest of our colleagues achieve their visions for progress and improvement in Los Angeles. You can see us talking about our plans for the year to come on New Year's Day at 11 am on Eyewitness Newsmakers on Channel 7. How many Ivanhoe students fit on one walk path? Pumpkin bread was enjoyed by many as Tom Labonge, Public Works Commissioner Dave Sickler and I joined a representative from Dario Frommer's office, communities, and what must have been about thirty thousands very happy fifth graders from Silver Lake's Ivanhoe school. I am in Charlotte, North Carolina, where I am attending the National League of Cities conference with many of my colleagues and thousands of city councilmembers, mayors, and city officials from around the country. It's always an extremely interesting conference, with a chance to learn what other cities are doing, share policy initiatives in Los Angeles with representatives from other parts of the country, and to mold a common federal legislative agenda to help cities. This afternoon, I participated in a standing-room only panel on city government and education initiatives entitled "So You Don't Run the Schools: How City Leaders Can Still Make a Difference..." You can view the an archived webcast of the discussion here (my comments begin 47 minutes into the panel). Mayor Rick Baker of St. Petersburg, Florida, outlined his very successful education initiatives over the last few years and three of us added our perspectives. 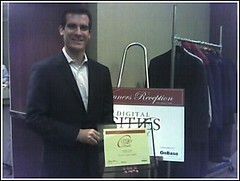 I attended a number of other very good panels, then stopped by the Digital Cities Award to pick up the award for the City of Los Angeles web site, rated the third best in the country. Considering how many cities we were up against, this repeat performance (we did well last year also), is impressive. 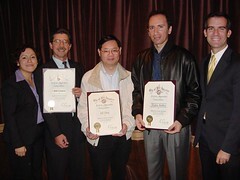 Congratulations to our web services team for their great work! I spent time in the evening talkig to number of mayors and councilmembers, including Mayor Anthony Williams of Washington D.C., the current president of the National League of Cities and a Los Angeles native, Mayor Bart Peterson of Indianpolis (where my better half, Amy Wakeland hails from), Manhattan Borough President C. Virginia Fields, who was my city councilmember when I went to Columbia University in New York City, and Mayor John Hickenlooper of Denver, among others. Tomorrow, I can't wait to attend a session entitled, "Can Blogs Improve Your Constituent Communications?". You know that I have a pretty strong opinion about that. More to come on that tomorrow. L.A. Journal (via Curbed L.A.) has an excellent pictorial history of a public art project at the northern tip of Elysian Valley. One caveat, however: Viewers from outside the neighborhood should know that residents prefer the designation "Elysian Valley" to "Frogtown". The latter, though it once referred to the frogs that would pile up on front lawns when the L.A. River overflowed its banks, has more recently become the name of a gang that has been responsible for various crimes in the area. Enjoy! Leslie Carrara-Rudolph is known to many Silver Lakers as the first-ever Queen of Silver Lake. As Lady Edna Faye, she won the honor in the 2001 contest where she performed the Wizard of Oz using only sockmonkeys. 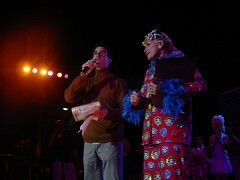 She came back the following year (pictured here) to turn over her crown to the new winner, and even pinch-guest-hosted. Her chief work is as a puppeteer; her puppet Lolly once came to visit me in office hours! Apparently, the CD13 field office must be a great launching pad, because now she's appearing on Disney's "Johnny and the Sprites", a show by the creator of Avenue Q. And I hear that Lolly herself has been seen touring with the Sesame Street Muppets—most recently visiting and playing with children in the Gulf Coast who survived Hurricane Katrina. We held our annual "Heroes' Luncheon" to recognize city employees who have gone the extra mile to get work done for our constituents. Nearly every member of my staff invited someone from one of the city's many departments who has helped us serve CD13 and whose efforts ordinarily go unsung. There's no better example of the kind of work we honor at these luncheons than that of Bob Camou and his team at the Department of Transportation. 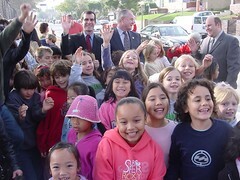 When a young girl was killed crossing Santa Monica Boulevard, I demanded that we overcome the considerable bureaucratic hurdles to installing a traffic light on that stretch of roadway before a new elementary school opened and even more lives were put at risk. Bob and his team got the job done, and at the beginning of the school year, the new light went in. The work my staff and I do is made possible by the work of the more than 50,000 employees of the City of Los Angeles. At our luncheon, we honored custodians, redevelopment professionals, green building designers, parking enforcement officers (that's right!) and community development project managers. It takes a lot of magic to keep a city like Los Angeles running, and there was a lot of magic in that room.